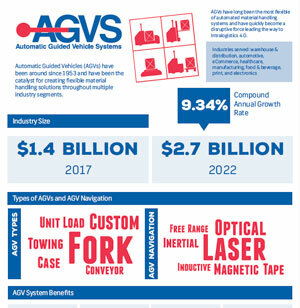 AGVS member companies meet regularly to review, discuss and revise the standards for design, performance and safe operation of automatic guided vehicle systems. 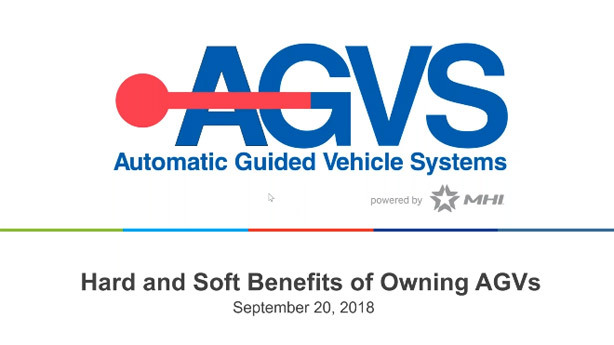 AGVS members are committed to the development, maintenance and publishing of industry standard specifications for these systems. The communication of the benefits of AGVS solutions via trade shows, educational forums, and other national and regional seminars. 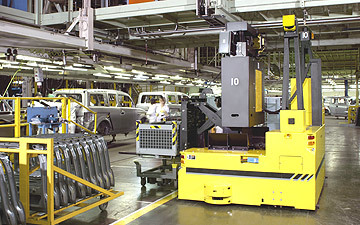 AGVs have quickly become leaders in the movement to Intralogistics 4.0. 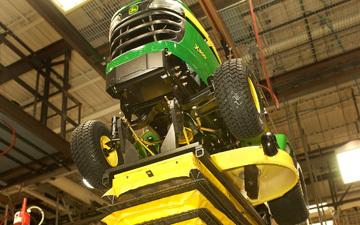 They are the ideal solution to supplement your human workforce and relocate employees to safer, more rewarding tasks. 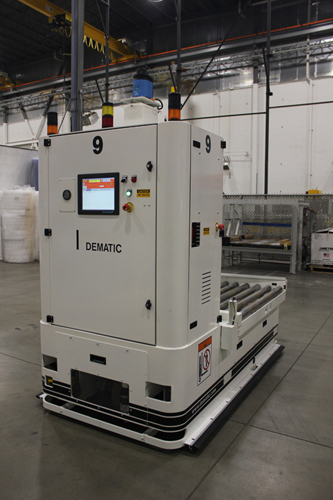 Unfortunately due to common misconceptions, many operators believe that AGVs aren’t a fit for their facility. 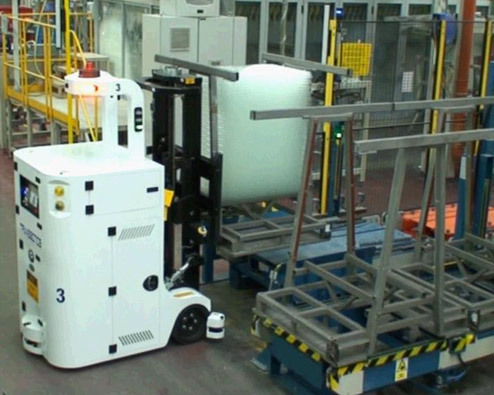 Driverless vehicles are coming, but they’re already having a major impact inside distribution centers and warehouses as the front line of the supply chain changes forever. The Automatic Guided Vehicle Systems Product Section strives to educate and promote the industry. One of the methods the industry utilizes to achieve this goal is through the collection of systems installation statistics and trends. 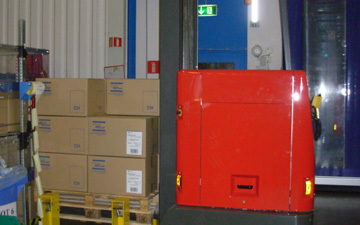 The collection of this data is a prerequisite and a continuing condition of AGVS Product Section membership. These statistical trends are compiled from information collected from current MHI AGVS Product Section Member Companies in good standing. Even though this data does not reflect the total market size, it does reflect the majority of new installations and indicates the breadth of the applications benefiting from the technology. It also indicates that a company does not have to be big to benefit! Small, simple systems can deliver just as much return as the larger more highly integrated systems, too. 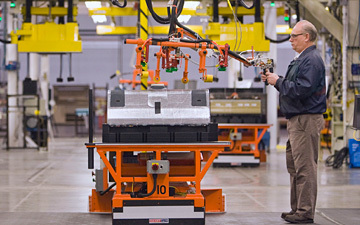 Evolution of AGVs - What's Available and What's to Come? The Material Handling Education Foundation, Inc. has awarded the $2,000 Automatic Guided Vehicle Systems Honor Scholarship to Bailey Butler at North Carolina State University. Bailey is a rising senior majoring in Industrial and Systems Engineering. She is currently working as an engineering intern at the North Carolina Department of Public Safety focusing on energy efficiency projects and at LORD Corporation as a Global Trade Compliance Student Associate. After graduation she plans to become a licensed professional engineer and join the workforce. She would also like to complete a masters degree in business to round out her background so one day she can be in a leadership position.